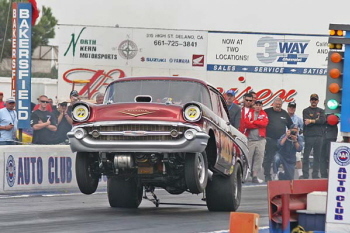 The Drag Racing portion of the 16th Annual Auto Club of Sourthern California Hot Rod Reunion, presented by Holley, took place all three days. 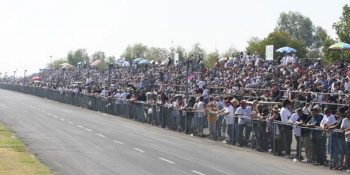 Despite the blockage on Interstate 5 between Bakersfield and Los Angeles, huge crowds packed the Auto Club Famoso Raceway in Bakersfield, CA. and made this the largest “Reunion” yet! 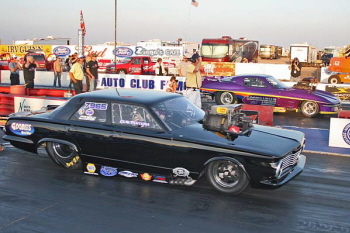 Brad Thompson took the Nostalgia Top Fuel class victory with the quickest and fastest time and speed of the meet – 5.721 seconds at 261.62 mph over Pete Kaiser’s 5.924 and 228.54 respectively. Thompson capped a perfect weekend in which he set the elapsed time and top speed records during qualifying. 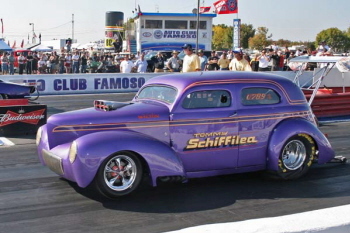 His was the quickest of 20 dragsters in the class, one of the largest showings in recent years. 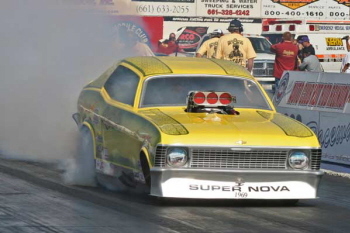 In Nostalgia Funny Car, run in the “Chicago style”, Bucky Austin took the honors in the “Northwest Hitter” over Terry Capp in “Bubble Up”. 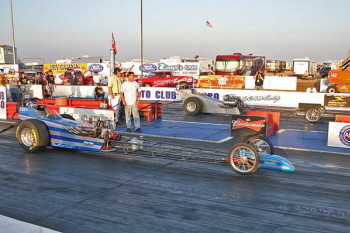 In Chicago style racing, only the top eight qualifiers advance to eliminations. At Bakersfield, 16 cars ran for time, sending eight home after just one qualifying run. The eight-fastest ran again, with Terry Capp and Austin the two quickest winners, advancing to the final. 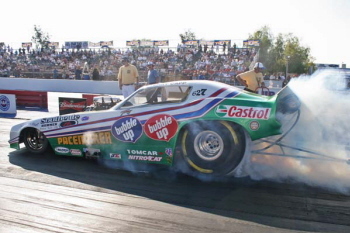 Capp defeated NHRA POWERade Drag Racing Series star Ron Capps, taking a brief break from the Countdown to One. 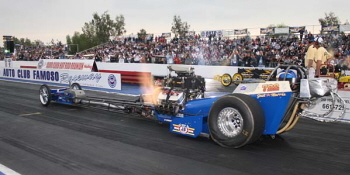 Capps’ POWERade Series crew chief in Reunion Grand Marshal Ed “The Ace” McCulloch. Several competitors came from outside the USA. 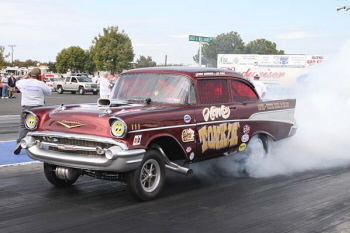 Coming from the UK was a 461 ci big block powered ’57 Chevy dubbed “Honky Tonkin’”. 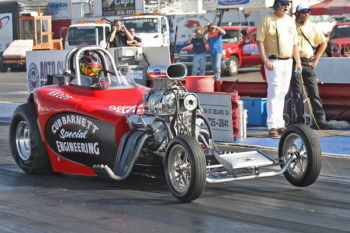 A Top Fuel front engined dragster owned by Roly Leahy came from Australia to compete. 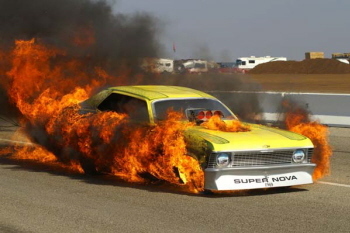 Perhaps the scariest moment in the event came when Funny Car driver Randy Walls lit his car on fire. Walls was able to exit the car and suffered only minor burns from the intense flames, but the car burned to the ground. 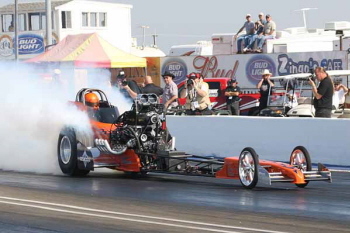 Brad Thompson took the Top Fuel class victory with the quickest and fastest time and speed of the meet – 5.721 seconds at 261.62 mph over Pete Kaiser’s 5.924 and 228.54 respectively. 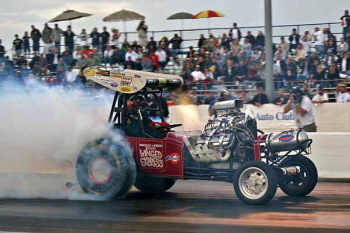 Jack Harris showin’ some “Header Flames” as he gets the green light. 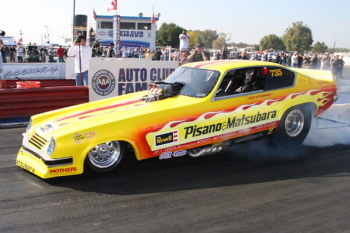 Jeff Utterback driving the sharp “Pisano & Matsubara” Funny Car qualified sixth with a 6.133ET pass. 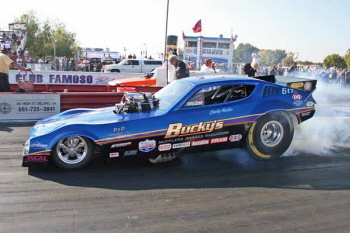 Ron Capps driving the new ’72 Dodge Charger “Future Flash” qualified seventh with a 6.145ET. 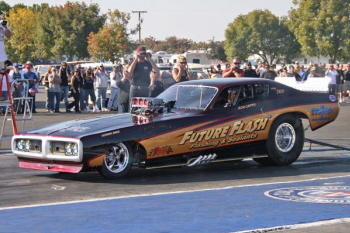 Last years Grand Marshall Roland Leong helped Terry Capp and his ’77 Firebird “Bubble-up” qualify and finish second. 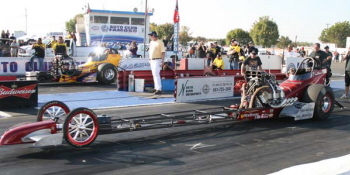 Bucky Austin took the honors in his “Northwest Hitter” Funny Car. The A/Fuel winner Darrell Waters lifts the wheels at launch as Dad Tony looks on. The A/Gas winner Tom Schiffilea. 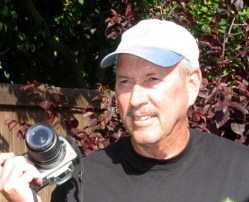 Nostalgia Eliminator winner Ronnie Lennon. Junior Fuel/B winner Fred Notkza (near lane) takes John Rasmussen. Sean Renteria (near lane) takes Chris Abbey in AA/Gas. 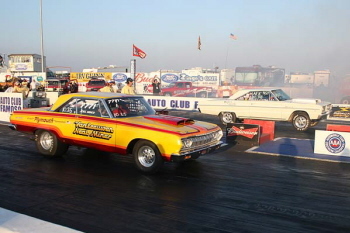 The all Mopar Final of AFX between Joel Minor’s ’64 Belvedere (near lane) and Jeff Dudgeon’s ’66 Coronet. Coming from the UK is this 461 ci big block powered ’57 Chevy “Honky Tonkin’”. 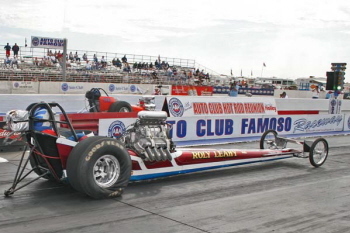 A Top Fuel front engined dragster owned by Roly Leahy came from Australia to compete. 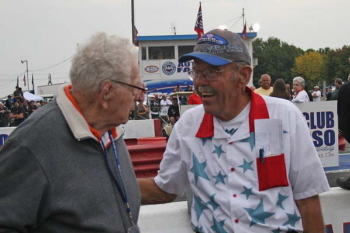 This is what the reunion is all about, friends like M & H Tire’s Marv Rifchin (l) and NHRA Chief Starter Rick Stewart have a chance to say hello. The crowd packed the stands. The Reunion would not be complete without a wild pass from the “Winged Express”.